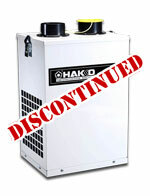 American Hakko Products (Hakko) announced the discontinuation of their HJ3100 Fume Extraction System. The Hakko FA-430 Fume Extraction System is the recommended replacement for the HJ3100. HJ3100 replacement parts are still available until current supplies are depleted. For replacement filters, order the FA-430's A1585 Prefilter and the A1586 Main Filter. To use the A1586 Main Filter with the HJ3100 Fume Extraction System, a free filter adapter (Part #: 999-241) is required. To obtain the adapter, register online at http://www.HakkoUSA.com/forms/adapter. The simple drop-in support frame adapter allows the FA-430's Main Filter to provide equivalent filtration efficiency and an increase in airflow performance for the HJ3100. 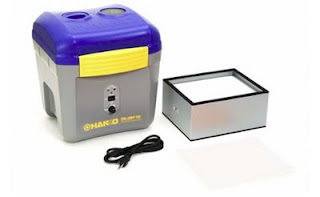 For more information about the Hakko FA-430 Fume Extraction System see our previous blog post. Check back with The Q Source Resource and our YouTube Channel soon for a video look at the FA-430. To order the FA-430 and related accessories, please visit QSource.com's FA-430 Fume Extraction System page. Get an ASG PS-55 Power Supply…FREE!